Can 'Gundam' fans build a six-story walking robot? Fresh from its defeat in women’s World Cup soccer, Japan wants to take on the U.S. once again—in giant robot combat. 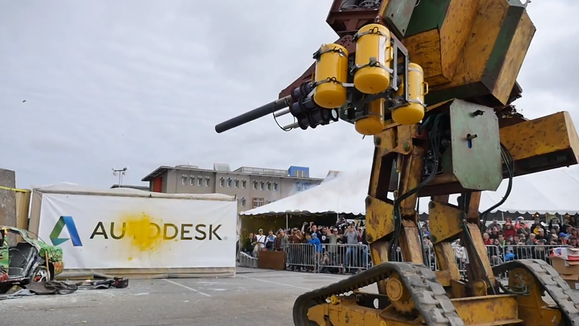 Suidobashi Heavy Industry has agreed to a challenge from Boston-based MegaBots that would involve titanic armored robots developed by each startup. While robot combat contests such as RoboGames are nothing new, the duel is being billed as the first of its kind involving piloted machines that are roughly 4 meters tall. Unveiled in 2012, Suidobashi’s Kuratas robot was designed by blacksmith Kogoro Kurata, who was inspired by the “mecha” robots of Japanese science fiction animation. 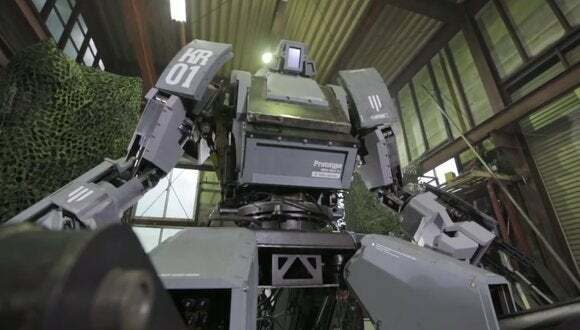 Weighing some 5,000 kilograms, Kuratas has three wheels, two arms, a one-person cockpit and various mock weapons that shoot pellets and fireworks. It was put on sale on Amazon Japan as a starter kit for ¥120 million ($976,000) but is now listed as unavailable. Suidobashi did not immediately respond to a request for more information. The contest, which would take place next June, set the hearts of robot geeks aflutter after the challenge was issued in an over-the-top video by MegaBots last week that has notched more than 2 million views. MegaBots’ Mark II robot weighs some 5,400 kg, is piloted by a team of two and moves around on tank-like tracks. Its cannons can fire 1.3-kg paint balls at 161 kilometers per hour. The company wants to build enough robots to form teams that would fight in arenas, but its 2014 Kickstarter campaign failed to reach its goal of $1.8 million. Kurata said he wants the robots to be able to engage in a full-on knock-down fight to make the duel interesting. Indeed, living up to audience expectations could be the most challenging aspect of the fight. Kuratas and MegaBots Mark II are very costly to make and carry human pilots, so allowing them to be destroyed or seriously damaged in battle would likely be out of the question. But the spectacle would be better than other robot clashes, and could even form the basis for an annual piloted robot championship. As viewers of the recent DARPA Robotics Challenge finals saw, contests involving autonomous robots can be painfully slow. Even the matches at RoboCup, an international competition aimed at developing fleet-footed, dextrous robots that can beat the best human soccer players, can move at a glacial pace as droids clumsily try to dribble the ball, kick it and then topple over.